If you have been getting a lot of use out of your scarf collection this winter but need a better way to organize them, check out this idea for a scarf hanger using shower rings. This saves on storage space in a drawer and in the closet and makes them all easy to see and find. You can check out this scarf organizer at From The Desk. I plan on doing this...just wish it was garage sale season to get the shower curtain rings but maybe at a thrift store. Thanks for sharing, I put it on my pinterest. This is very clever. I've been using a tie organizer. So much better than my old method (stuffed in drawers everywhere)! It was so messy and I could never find what I wanted. 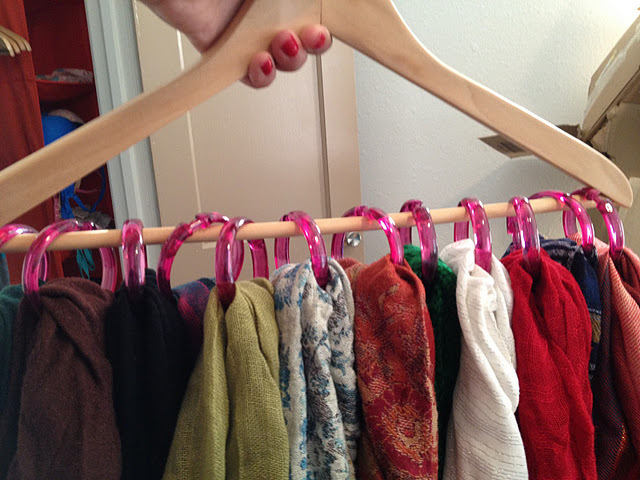 This is such a cheap alternative to buying a scarf hanger from the store! :) I got my shower curtain rings for $1 at the Dollar store and used an old hanger lying around the house. This could also used as a tie or necklace organizer. Thanks for the tip! Thanks for this -- saw (and re-pinned it) and actually made it yesterday...cute and convenient. Great idea! Project tonight.. Definitely sharing! I made this last night. How do you keep the shower curtain rings from sliding around, so that all the scarves don't end up all bunched up on one side of the hanger, making the hanger completely lopsided?? To keep them from sliding around on the hanger you could put a thick bead of hot glue at intervals. To keep the shower rings from sliding all over I used some large glue dots and just stuck the shower ring on top of each one- no more slippage! I can't thankyou enough for sharing this!!! I love my scarves!!! I have been searching for a long time to find an easy DIY storage solution and I think this is the best one ever!!! THANKYOU.